We are currently seeking a qualified Technical Support Manager to join our team in San Jose, CA. Technical support to Sales, Sales channels and Technical teams (internally and externally – installers) – ‘clients’. This position requires an individual who is analytical and detail-oriented with excellent troubleshooting and problem-solving abilities. They must have strong communication, leadership and management skills, in addition to excellent customer service skills and the ability to assist clients in the customized installations of the products. Required are strong communication, technical, and computer skills including a high proficiency with technical concepts. Manage the overall support relationship with the ‘clients’, which includes, but not limited to interaction/meetings, presentations, escalations, incident management, service level reporting, and release coordination. Creates and executes project work plans and revises as appropriate to meet changing needs and requirements including release planning and coordination both internal and external for scheduled and emergency maintenance events. Timely generation of all technical drawings required by salespeople, customers, and contractors for use in the proposal, submittal, quotation, and permitting of solar products (roof layouts and other basic diagrams, etc). Creating and maintaining a robust design library in support of projects nationwide. Playing an important role in defining and shaping the look and feel of submittals to all of our customers nationwide. Provide customers with timely system design support up to and including system layout, elevations, details, and other items as necessitated for use in estimating, proposal generation, permitting and quotation. Interfacing with Technical Support Manager as required to field project-related questions regarding system layout, module positioning, shading assumptions, etc. Provide administrative support by assembling design related project supporting documents, as well as, assembly of complete design sets for distribution to the field; Manage revisions and prepare as-built drawings. Develops and maintains submittal drawing templates and MS Visio design library. Assists with drawing support required for literature and collateral generation. Previous design experience, preferably in Solar but not required. 2+ years’ experience related to design/drafting of solar/systems or installations. MS Visio, AutoCad, or related design experience required. Excellent math, proofreading, communication and organizational skills. Familiar with ANSI – American National Standards Institute and/or ASME – American Society of Mechanical Engineers and/or CA Building Code (CBC). Ability to work independently and achieve high throughput; multitask and meet deadlines. Tolerance for ambiguity within a fast paced work environment. Ability to support and effectively communicate with sales representatives nationwide over the phone and e-mail. Flexible schedule and ability to work overtime, nights, and weekends as requested. Strong skills with all MS Office applications. Efficient time management and ability to multitask. NABCEP Certification preferred, but not required. We are currently seeking a qualified Sales Manager to join our team in San Jose, CA. Provides ongoing feedback to management regarding forecast, trends and performance. Plan, organize, direct and control the sales team to meet objectives. Insures that sales meet or exceed all activity standards for prospecting calls, appointments, presentations, proposals and closes. Conducts one-on-one review with all sales to build an effective communications, to understand training and development needs, and to provide insight for the improvement of sales. Maintains accurate records of all pricings, sales, and activity reports submitted by sales. Work with marketing dept to creates sales tools and presentations. Work with marketing dept to creates and conducts proposal presentations. Assists sales in preparation of proposals and presentations. Conducts regular coaching and counseling with sales to build motivation and selling skills. 5-7 years of experience in sales management in the solar industry. Proven leadership and ability to drive sales teams, agents and distribution channels. Develop relationships with key decision makers, understand and respond to customer needs, track and monitor contact/project activity. Set realistic expectations, clearly define project scope of work, and negotiate price on project opportunities to new clients. We offer an extremely desirable and aggressive Commission only compensation package. We will be adding a number of qualified candidates to our sales force across the Nation who will operate as Independent Sales Representatives. These individuals may already be working within the industry, but by taking on this role can and will have the ability to add significant additional income by representing Free Hot Water’s Solar Thermal and material’s product range. Dealers – Experienced plumbing and building contractors can build their existing, or new business into a highly profitable future within the high-growth Solar Hot Water industry, which is growing at an exponential rate. As a Certified Dealer you will have access to training as well as sales and installation leads in your area. Here is the opportunity to get in at the ground level today. Installers – Experienced plumbing and heating professionals interested in joining our growing database of installers for possible contract work. Internet Communication – Develop communication programs to introduce products and maintain ecommerce sales site and partner websites. Assist in developing and placing of on-line campaigns. Ensure on-line strategy is aligned with company goals. Trainers – Provide hands-on installation of commercial and residential solar thermal systems for interested dealers and installers. These training programs cover solar resource fundamentals, solar thermal applications, components, codes and standards, and federal/state grants and incentives. As the US stock market sags, the solar industry appears to be surging. 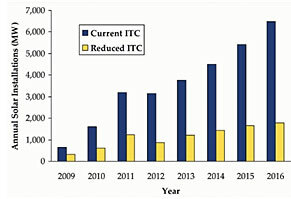 Solar has grown for the past several years, but it received a major boost in October when President Bush signed into law an eight-year extension to the solar investment tax credit (ITC). 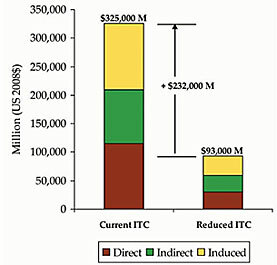 With the incentive in place, the industry expects to add 19 GW of solar energy from 2009–2016, equivalent to a $232 billion investment, according to the Navigant Consulting report ‘Economic Impacts of Extending Federal Solar Tax Credits’. Most striking, the report forecasts the addition of 440,000 jobs at a time when employment is shrinking in many sectors.